Above are two comic art illustration by Will Elder in MAD. 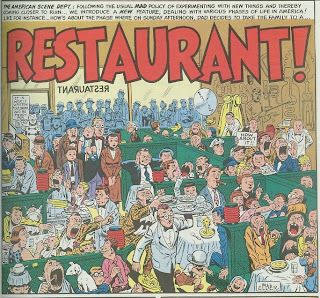 The top on is from MAD comic book #16 and the bottom one is from MAD magazine #24, which is the first issue MAD used a magazine format. Look at the many many little details. Some you will have to think about. 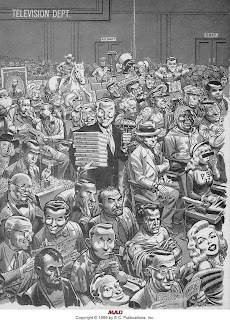 In the case of the black and white the newsy happenings of the time is reflected in the audience – for instance, Arthur Godfrey fired Julius LaRosa… if you didn’t know that, the two here may not strike you as funny. And here is a self-portrait of Will. Bhob Stewart on his blog Potrzebie Potrzebie has a bit and a link to an excellent article for AIGA (American Institute of Graphic Arts) about Will Elder by Michael Dooley. 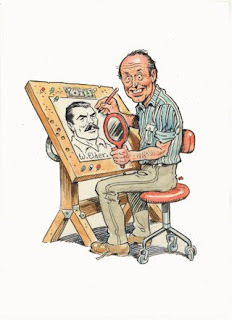 In the article Dooley tells how masterly Will has lampooned and led the lampooning field. 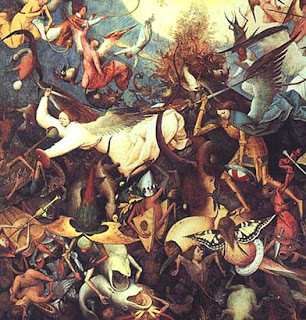 He mentioned that Will appreciated the art of Dutch artist Pieter Brueghel the Elder (c1525-1569). In this case the title The Elder is not the official rank in a church, but to do with family standings. He had a son named Pieter Brueghel the Younger. 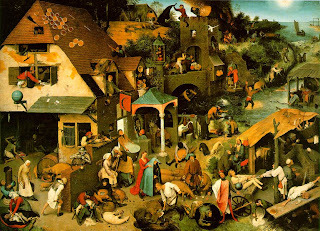 Below are a few paintings by Pieter Brueghel the Elder. Not all is paintings had small details, but these are examples of the ones that did – were they an inspiration to Will? 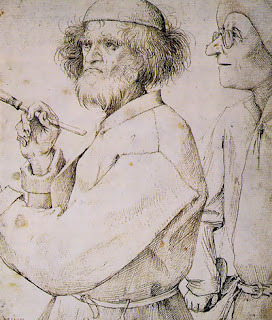 And here is self-portrait of Pieter Brueghel, the Elder. Eat More Watermelon! Everything Flows Better!